The comprehensive Markdown reference guide in book format. This website has helped tens of thousands of people master Markdown. Now you can take it with you. 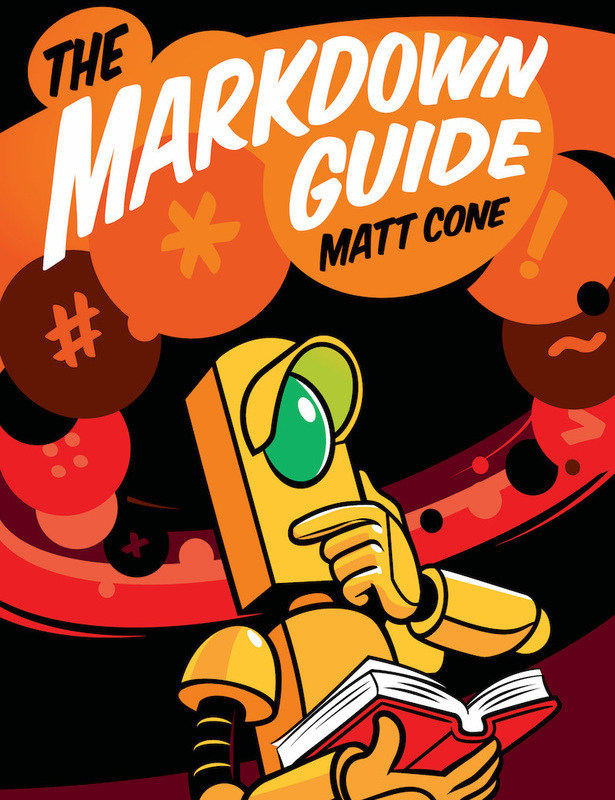 Introducing the Markdown Guide book. I want everyone to read the Markdown Guide. That's why it's free to download in PDF, EPUB, and MOBI format. Feel free to share it with your friends and family. The Markdown Guide is also available from Leanpub and Amazon. This is an open-source project, and your contributions are welcome. The repository is hosted on GitHub. Find something wrong? Create an issue on GitHub and I'll fix it as soon as possible. Thank you! My name is Matt Cone. I'm a technical writer, and I've used a lot of writing tools over the course of my professional career. One of the most interesting tools I've encountered is Markdown. I've been using Markdown for years now and I recommend it to everyone I know. There are lots of reasons why you should learn to write using Markdown, but one of the best reasons is that it's better than the alternatives. Learning Markdown means you can stop using all the subpar writing tools you've tolerated for years. It can also further your career. Believe it or not, knowing how to write using Markdown is a requirement for many jobs. My litmus test for a successful writing tool is whether using it can become second nature. Does writing with it feel natural? Or do I feel like I'm constantly fighting against it? I stop using tools that hinder me. Time is valuable, and I don't have the luxury of indulging things that squander that precious resource. Markdown passes the test with flying colors. Writing using Markdown just feels right. Since its introduction in 2004, millions of people have starting using it to write everything from notes to documents. It's one of the most successful markup languages of all time. Markdown has succeeded where other markup languages have failed because it strikes the right balance between power and simplicity. It's easy to learn and simple to use. Its tremendous success means it's ubiquitous enough to replace WYSIWYG editors on websites like Reddit and GitHub. But Markdown is also powerful enough to create documents, books, and technical documentation. Markdown is literally everywhere. So you want to learn to write using Markdown. Great! Now what? I was in your shoes once, too. I wanted to learn Markdown, but I couldn't find any good resources for beginners. That's why I decided to create the Markdown Guide. It's designed to be a comprehensive reference guide to the Markdown markup language. The Markdown Guide contains all of the content on this website, but it's been updated and expanded to include more examples. And it's not finished yet! Like the website, the book will continue to be updated on a regular basis with new sections and chapters. Matt Cone is a technical writer at Fastly. He has over ten years of experience creating documentation for organizations like Linode and the U.S. Department of Health and Human Services. Matt's first book, Master Your Mac, was published by No Starch Press. To get in touch with Matt, visit http://mattcone.com.